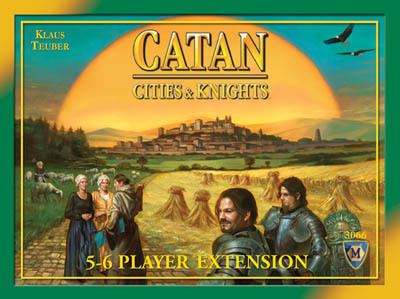 Extend your Catan Cities & Knightsâ„¢ to accommodate 5 or 6 players. Allows for two additional players to be added to Catan Cities & Knightsâ„¢. If you have more than 4 friends and they like cities and knight then this is a must have. Like the regular settlers expansion this adds some slight variations to speed up game play. If you're like me and have played the heck out of your Settlers base game, pick this up along with the Cities & Knights base to instantly breathe new life into your game. The sheer amount of interaction and planning that you add makes this expansion worth it. If you're looking to make Settlers more interested, stop thinking and pick this up! If you are reading this review it means two things: You probably own Cities and Knights, and you are reading this instead of buying this expansion. Buy it now! A 6 player game of cities and knights catan, and throw in a Seafarers expansion, and you've got an unforgettable game night!